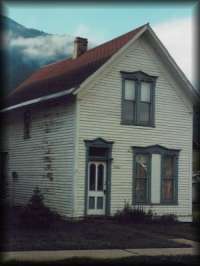 In April, 2008, the third phase of an ongoing project to restore our sanctuary and parsonage will come to an end. The reconstruction of our two buildings has been a huge challenge to our small congregation. That we have gotten this far serves as a true testament to the faith of our year-round members, our "summer regulars" and our many friends throughout this country and many foreign countries who provided us with spiritual and financial assistance. We also owe a debt of thanks to the Colorado Historical Society's State Historical Fund for providing us with the grants to restore our church. For over one hundred twenty years, Silverton's severe high-elevation exposure to the elements and its long hard winters in particular, had taken a cruel toll on our buildings. 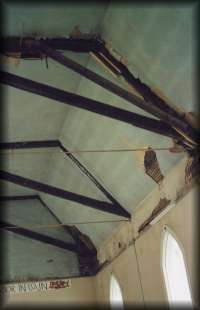 The last major effort to repair our church was in the 1950's when a false lower ceiling was installe d in a misguided attempt to save on heating costs. 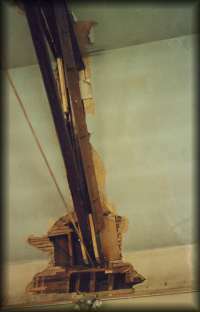 This caused the walls to bow outward to the point where a gap existed between the ceiling and the walls. 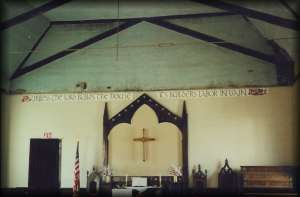 In addition, the sanctuary suffered from significant exterior and roofing problems and in 1998 a burst water pipe resulted in extensive damage to the parsonage. Something had to be done to save First Congregation Church. People who live in Silverton value our heritage as a mining town and the community encourages preservation of our Victorian-era buildings. In the past, the town turned to the State Historical Fund (SHF) for help in rebuilding the town hall which was seriously damaged by fire and for assistance in preserving our country courthouse. Following the town's lead, in 1998 church members applied to the SHF for a $10,000 Historic Structure Assessment (HSA) grant. Our application was good enough to be featured as an example of an HSA project in the fund's Grant Program Guidelines booklet. We won the $10,000 and along with the congregation's $2,500 in matching funds we hired A-E Design Associates, P.C. to produce a multi-year, prioritized and phased Preservation Master Plan. In October, 2000, First Congregational Church applied to the SHF for a grant to fund the first phase in our Preservation Master Plan and in January, 2001, we were awarded $94,352 for Exterior Restoration of the sanctuary. Within a few months we signed contracts with A-E Design Associates P.C. to provide architectural and engineering services and with an experienced local firm, Klinke and Lew Contractors, for the actual restoration work. In common with all SHF grants, we as the grantee were required to provide matching funds; this time the amount was $31,450. As much as saving the church and parsonage has been a wonderful achievement, the raising of significant amounts of money for matching funds by our church members and our many friends has been a real miracle. Besides accepting donations we have held E-bay auctions, raffled quilts and sold copies of Ansel Adams' famous "Silverton" photo featuring our church as its centerpiece. Phase one work involved removing all the plaster and lathe from the ceiling of the church. In so doing, the contractors discovered that the timber roof trusses had failed with several breaks in the timber chords and struts. New steel reinforcements and tie rods were fabricated to bridge these breaks while leaving the historic timber trusses in place. The brick chimney was restored and the side bearing walls were stabilized. Following removal of the old shingles from the sanctuary roof, new tongue and groove sheathing was screwed onto the existing sheathing and the roof was reshingled. Our contractors came up with an innovative way to install new roofing on our steeple. Instead of using conventional methods to replace the roof, they contacted Bill Alsup, who owns a crane to remove the roof from the bell tower. Placing it on the ground in front of the church made it easier to replace the shingles and brought the restoration process up close and personal to community members and visiting tourists. The nearly $1000 for use of the crane was donated by Alsup, constituting another blessing for our church. Other groups have volunteered to help us out. A dozen Denver area members of the Ghost Town Club of Colorado worked on the church for a week. They fabricated and installed steel bracing and assisted the contractor in performing groundwork on the trusses. They also cleaned and oiled all of our church pews. Phase one was completed in April, 2003. Immediately, another application was filed with the SHF to fund Phase two of the Preservation Master Plan. In October 2003, we were awarded $106,794 for Structural Restoration. This grant required us to raise $35,598 as our matching funds. Completed in February, 2006, the work included repair and painting of exterior siding and trim, insulating ceiling and walls, rock lath and finishing on ceiling and walls, repairing and painting belfry features, repairing the masonry foundation, opening of the east exit door, and restoration of wood eaves and fascia. From the start of our restoration project in 2001 until the completion of Phase two in 2006 we were unable to worship in our building. In the spirit of cooperation and graciousness that typifies Silverton, St. Patrick's Catholic Church allowed us to worship in their building on Sundays. We extend grateful thanks to Father Nat Foshage and his parishioners for their kindness. In early 2006 we returned joyfully to worship in our own church, but restoration was not finished. In October, 2005, we applied for our third SHF grant and in April, 2006 we were awarded $119,775 for interior and exterior restoration plus $9000 for a Historic Easement fee. Once more, we were required to raise $39,925 in matching funds. We renewed our contract with architect Lynn Lohr of Portland, Oregon, and signed a contract for archaeological services with Alpine Archaeological Consultants, Inc., of Montrose, Colorado. Phase three of work in the sanctuary has involved restoration of windows, doors, flooring and wainscoting; interior painting in three colors; a new carpet; conversion of the storage closet into an unisex, ADA-compliant bathroom with congruent construction of an ADA access ramp into the building; completion of electric rewiring and the installation of beautiful new light fixtures. The parsonage has undergone restoration and painting of the exterior; restoration of the chimney; reroofing; restoration of doors and windows and a complete updating of the heating system. An interesting footnote to the reroofing of the parsonage was discovery of a book titled The Writings of Armenius, published in the 1853, which was hidden in the eaves. We're guessing that one of our former pastors did not want his parishioners to catch him studying the ideas of Armenius. The total cost of rebuilding our church and parsonage is $449,394, $339,921 from SHF grants and $109,473 from our matching funds. Everyone in our congregation has been involved in one way or another so it is unfair to single out any particular individuals for praise, but without the efforts of Penny Moore, Dennis Kurtz and Loren Lew this restoration project would never have succeeded. A special thanks also to grant writers George Chapman, Kyle St. George and Bob Boeder. In addition, we would like to thank James Stratis of the Colorado Historical Society for his advice and support. With the restoration work done, the First Congregational Church of Silverton once more has become a visible, viable, functioning element of the community. 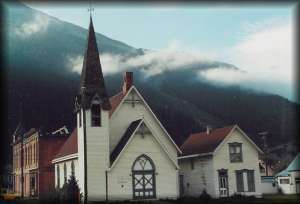 It has a role in the cultural life of Silverton while addressing the spiritual needs of our fellow townspeople. In the future we look to the interior restoration of the parsonage - the work goes on!